"Violinist Knows Value of Taste"
"Japanese Violinist Performs at Tilles"
Hideko Udagawa has revealed one of the violin repertoire's most puzzling anomalies: compared to his fellow Soviet composers, Prokofiev and Shotakovich, Aram Khachaturian seems neglected. Yet his music for violin and piano combines the kind of accessibility that should guarantee broad popularity with the kind of high seriousness that should ingratiate it with even the most fastidious critics. The dances have remained pretty much the private preserve of Russians like Oistrakh and Kogan (and Heifetz, an expatriate Russian himself, arranged and played "Ayesha's Dance" and the "Sabre Dance") - when they were played at all. How does Ms. Udagawa account for these pieces' relative obscurity? "Probably people see Khachaturian as a ballet composer. He composed symphonies, but fewer than did Shostakovich or Prokofiev. And his music for the violin and piano transcriptions isn't easily available. Heifetz's transcriptions of the "Sabre Dance" and "Ayesha's Dance" were easy to obtain, but I had to go special routes to get the Russian editions of the ones by Mostras and Feigin. In addition, while making this recording, I asked a friend to transcribe more pieces." Will those new transcriptions become available? "If people request them, of course, my friend would be happy to publish them. Let's hope that will happen. I even played from a manuscript. Khachaturian's grandson released his grandfather's material (for the Dance No 1) from family archives. Again, if people want it, it could be published. It would be nice if it happened like that - if I could help make his chamber music or violin and piano music more popular - because it's so beautiful, and I enjoyed playing it so much. If more people listen to and play it, I'll be very happy." Did the repertoire's ethnicity present any stylistic challenges? "I was always interested in Russian music, and, of course, I studied with Milstein - he flattered me, saying I probably had some Russian blood in me. He had such understanding of Russian music, and I learned from him how to approach it. You know, he had played the Prokofiev Sonata with Prokofiev himself at the piano." Was that the First of Second Sonata? "Both! But I prepared those pieces in my own way. And Boris Berezovsky is the soul of Russian music, so he was the ideal person for this recording. As we discussed and rehearsed, we discovered more and more, and the interpretation deepened. We rehearsed quite a bit, more than was necessary; sometimes, because we enjoyed it, we rehearsed all day long. He liked the music, too, and was also surprised that so many of the composer's works for violin and piano hadn't been recorded." The short pieces, from the earliest to the latest on the program, sound very effective on the violin. Do they lie well on the fingerboard? "I've played most of Khachaturian's music for violin. I didn't find the concerto difficult - it's rather well fitted to the violin. But the transcriptions, or even the original pieces, are somewhat more difficult. I wouldn't say they're not well suited; but the Sonata isn't so well written for the instrument - maybe because he was a cellist. Some passages were awkward, not easily playable or violinistic - unlike the Concerto." Did Oistrakh have something to do with the Concerto's more idiomatic writing? "I'm sure. And the cadenza's so well written by Oistrakh." Did Ms Udagawa learn these shorter works just for the recording? "Yes. First, I came across the Sonata's music. When I realized that nobody had recorded it, I began to think that I should do it; and then I planned the recording's program of Khachaturian. At first, there weren't enough pieces; but I gradually discovered more and more, and through an introduction to the family, I got hold of one of the manuscripts - and, as I said, my friend offered to make transcriptions. I did all that for the recording, but I'd like to add some of those pieces to my repertoire - they're really lovely. And it's so satisfying to discover unrecorded works by great composers. I started to search for more Russian composers' unrecorded pieces; and I'm preparing another collection along the lines of the Khachaturian CD. I hope you'll find more Russian composers' premiere recordings in Koch's catalog in the future. That's my passion at the moment." Koch's recorded sound seems very live and close up. Was she happy with the result? "Yes. Actually, when I make recordings, I like a rich, warm sound, since the violin is a very old instrument. I don't like too much digital modern sound. Of course, that brings a lot of clarity, but I don't want to lose warmth. I'm always very conscious of that." Ms Udagawa's performances recalls Milstein, Heifetz and even Oistrakh. Which violinist's style most deeply influenced hers? "Obviously I've been influenced most of all by Milstein. Next would be Heifetz - but, of course, I admire so many of the 20th Century's great violinists. They're very individual, and I learned a lot from them - but especially from having lessons with Milstein and listening to Heifetz." How did she manage not to be overwhelmed by Milstein's personality? "I studied with him when I was very young - I'd just come from Japan. He was generous with his time; and I was very fortunate to have two lessons a week, with one lesson sometimes lasting three hours. I could go through all the violin repertoire - and he always let me record the lessons. I have a collection of all of those Milstein lessons - he played a lot in them. When I listen to them, all the memories come back. Actually, it's my secret ambition to release them sometime. But studying with him could be, in some ways, very confusing. Because he was so individual, certain things worked only for him and not for every other violinist. I had to decide which things suited me, which didn't. But you couldn't avoid his influence - and not only on technical points and on the production of tone: he emphasized the importance of good taste. You know, he was well known to be the aristocrat of taste. I learned so much from him that I probably wouldn't be the violinist I am now without him, and I'm so grateful. But, of course, I gradually started to find my own way, not just copying. Now, although I owe so much to his advice, I like to think I have my own style. Young violinists don't have so much individuality now - it seems to be going more and more that way. The great masters' individuality is very satisfying to listen to - their expressive range and tone, not just technique. Many younger players have more technical perfection, but not so much personality and individuality, and you often can't detect who's playing. Personality is so important, I always like to aim to have that." "He plowed up new, hitherto untouched layers of the musical folklore of the Caucasus and, using the traditions of folk and professional music, created works of inimitable originality, thoroughly modern and permeated with traits of genuine innovation...it is difficult to imagine the Soviet and world musical culture without Khachaturian." - Dmitri Shostakovich on Aram Khachaturian. A powerful influence - and yet a mere 25 years after his death, Khachaturian's music is rarely performed, relegated to the 2 AM slot on all-night soothing classical radio programs and the music-beds of TV advertisements. If you hum the first few bars of the "Saber Dance" from Gayneh in a room full of people over the age of 50, a few may recognize it as the soundtrack for a circus act that appeared on "The Ed Sullivan Show." "It's such a shame," says violinist Hideko Udagawa , speaking by phone from London, "that more of his music is not so widely known. It is so rich, so vital, so very original and colorful." Her own recent discovery and exploration of Khachaturian's catalog has resulted in a new CD with pianist Boris Berezovsky which includes several works recorded for the very first time. In celebration of the centenary of the composer's birth, Aram Khachaturian: Sonata and Dances (Koch International Classics) offers a program of original works and transcriptions that opens a new window on the composer's legacy. "One day I was given Khachaturian's Sonata for Violin and Piano," Udagawa says, describing the beginning of an affair with music that has become a great passion for her. "Most of it was unfamiliar, and I wondered why, because when I began to really look at it and listen to it, I thought it was stunning: really beautiful, full of character and genuine human emotion." As Udagawa began looking for more music by Khachaturian, she also looked for recordings - and discovered very few for violin and piano. The same few "big" pieces - Spartacus, Gayaneh, the Violin Concerto - have been recorded repeatedly, but little or none of the composer's more intimate instrumental works have been recorded, and only seldom do they show up in recital programs in the West. Khachaturian's career path was hardly conventional; at a time when prodigies seemed the norm, he neither read nor wrote music as a youngster, and did not begin to study it until he was in his 20s. Rather, he started at Moscow University as a Biology student; when he finished his studies at the University's Gnessin School of Music, he was over 25. And yet his legacy of innovation and synthesis of ideas and cultures is sophisticated and organic, marked by a soaring lyricism and a degree of coloration that feeds on his Armenian heritage while maintaining the structures and forms and of Western art music. In a professional career that started relatively late, his output (not catalogued during his own lifetime, apart from published works) was vigorous and diverse, including symphonic music, concertos, choral works, ballets, film scores, dramatic music, chamber music and songs. "The new recording includes the premiere recordings of the Sonata for Violin and Piano (1932), an Elegy (1925), and several new transcriptions of movements from the ballet music. Throughout the program, Udagawa's musical partnership with Boris Berezovsky has energy and freshness. Berezovsky was born and trained in Moscow, winning the prestigious Gold Medal at the 1990 International Tchaikovsky Competition ("He is a pianist of astonishing maturity, dazzling virtuosity and formidable power," says The Times of London). "He has such a marvelous feeling for this music," Udagawa says, "and he puts so much of himself into the performance. "As the project to open up Khachaturian's music took shape, the world of Russian violin music opened up in a new way for Udagawa, who studied with the late Nathan Milstein. "I was no stranger to the traditions of Russian violin playing," she notes, "But my sense of connection to Russian composers and repertoire has grown stronger. Milstein studied Prokofiev's works with Prokofiev. I feel almost as if I am doing the same thing here." She has expanded her research to include some other Russian composers whom she feels have been under-represented, not just on recordings but in the concert hall. Several programs of new repertoire by Russian composers, some written for the violin and some transcriptions, are in development. "I feel a certain sense of responsibility," she says, "A sense of stewardship. I want to see to it that this music reaches new listeners and new performers everywhere. It's not often that a musician has this kind of privilege," she adds, referring to the opportunity to shepherd into being a whole new set of repertoire for her instrument; "and it is totally, completely worth it!" At Khachaturian's 70th birthday, His Holiness Vazgen I, the Patriarch and Catholicos of All Armenians, offered a special birthday blessing: "Blessed be your wonderful life," he said, "and your marvelous music that lighted the whole world with its rays and glorified the creative genius of the Armenian people." He added, "You will live long, you shall live for ever." If Hideko Udagawa has anything to say about it, it shall be so. A Russian maestro once told Japanese violinist Hideko Udagawa that her grasp of that nation's composers indicated she had Russian blood coursing through her veins. Udagawa's latest CD, Aram Khachaturian: Sonata and Dances (Koch), is further evidence that this former child prodigy is tapped into Russia's collective soul. The stunning disc (with Russian pianist Boris Berezovsky, shown above on the left) features seven world-premiere recordings. It commemorates the centennial year of Khachaturian (1903-1978), one of Russia's best-loved composers before he was denounced in 1948 by the Soviet regime - along with Shostakovich and Prokofiev-for writing elitist works. The disc also enjoys a bond with filmmaker Peter Rosen's remarkable new documentary Aram Khachaturian, which is making the rounds this fall on the North American film-fest circuit. Rosen (who directed a music viedo for Udagawa, which is included on the enhanced version of her new disc) introduced Udagawa to Khachaturian's grandson, who then offered the violinist the previously unpublished manuscript to Dance No 1 (1925) from the family archives. Other world-premiere recordings on the new CD include the rarely heard but powerful Sonata for Violin and Piano, Elegy, the Nuneh Variation from "Gayaneh" (transcribed by L. Feigen), Nocturne from "Masquerade" (transcribed by the composer), Ayesha's Dance from "Gayaneh" (transcribed by Jascha Heifetz), and Dance of Egyna from "Spartacus" (transcribed by K. Mostras). Of course, Khachaturian's best-known piece, Sabre Dance from the 1942 ballet "Gayaneh", also is included in a raw (and quite difficult) transcription by Heifetz. "Khachaturian has so much love, so much emotion for his music - his happiness, his sorrow, everything comes out in his music," says Udagawa. "His music is so colorful, so original." Her interest in the Khachaturian project started when a friend introduced Udagawa to the Sonata for Violin and Piano, which she had never heard before. "I started to look at it and though, what an interesting piece," she recalls. Udagawa was astonished to find that no one had ever recorded the work. She soon started to research Khachaturian's other works and found several unrecorded pieces by the composer. "I feel that he is very underrated as a composer and was surprised that so many of his works were unrecorded," she says. "I feel like it's my mission to bring this music to a new generation and that more people should play his compositions. "I have so much passion for this!" "It's the centenary of his birth, so why not?" asks violinist Hideko Udagawa, referring to her new Koch CD dedicated to chamber music by Armenian composer Aram Khachaturian (1903-1978). Khachaturian, best known for his atmospheric ballets Spartacus and Gayaneh (which spawned the hit "Sabre Dance"), is overdue for a reappraisal and finally gets one this fall. Khachaturian's music speaks directly to listeners, Udagawa insists. "And that's my current mission: to bring his music to more people," she says. "I'm planning a U.S. tour next year and I want to include his music in it." 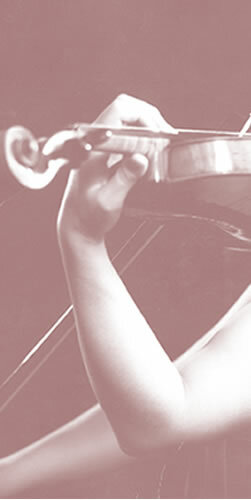 There is no more competitive career in the musical world than that of the concert violinist, and so Hideko Udagawa wisely spent the last few years developing her repertoire and establishing a considerable reputation before launching out with her first big concerto recording (a coupling of the Brahms and Bruch No 1 Concertos, on Chandos - see reviews). This therefore seemed an appropriate occasion to look back and reflect upon how it all began. "It's a funny thing, but nobody in my family was particularly musical; my father was a professor of electronics, and my mother played the piano only as a bit of a hobby. When I was six years old, she encouraged me to have violin lessons, but nobody even dreamt that I might eventually become a professional violinist. My father was quite keen to take me on as his assistant, and I had half an eye on becoming an interior designer, but I liked the violin so very much that it was almost as if it chose me rather than me choosing it! My mother never had to force me to practise or anything like that; in fact she sometimes worried that I might be overdoing things a litte! "At this stage I had a fine teacher, but it soon became obvious to my parents that I was going to need someone of exceptional talen to guide me properly. Unfortunately, they had no experience or contacts to help them, so once I was in my early twenties, I finally took the situation in hand, and came to London in the hope that I might persuade Nathan Milstein to teach me. I played several concerts, and met many people, but no one who could introduce me to the great maestro. Finally, one evening, I took the bold step (after seeing him in concert) of going backstage and asking him outright, and to my amazement he gave me his private number and asked me to call him next time he was in town! I did, and he invited me round to his flat and agreed to give me lessons. "He wasn't easy as you can imagine, and was very demanding; yet his teaching had a profound influence upon the way I play, and my whole attitude towards the instrument. Sometimes I am even told that my way of playing is rather old-fashioned, which I rather like! In the beginning I tried to imitate the way he produced that unique sound, but I gradually discovered (with some difficulty!) that I had to find my own way, and incorporate his ideas rather than merely copy them. I think that above all, I learnt the importance of a refined taste; all the great masters have developed this instinct for phrasing and treading that fine line between, for example, exquisite lingering and plain over-indulgence!" Discussing her favourite repertoire, one could see the influence of Milstein extending still further. She made her Carnegie Hall début earlier this year with the Bruch Concerto (a special favourite) and was immediately invited back to play again next season. "Yes, I enjoy playing this piece so very much, and was thrilled when Chandos gave me the chance to record it. I am a naturally spontaneous musician, so that I didn't feel in the least inhibited by the recording process, and I must say what a delight it was to work with Sir Charles Mackerras and the LSO; they were so encouraging and supportive that I felt able to relax and really play from the heart." Hideko also harbours a special love for the shorter encore pieces which stems directly from her admiration for Heifetz: "One of my very first recordings [on ASV CD DCA 624] featured a small collection of these miniature gems. It's a shame that these have gone so out of fashion nowadays; in fact whenever I plan a solo recital, I make a special point of including a few of these rather than merely relying on the meatier sonatas and the like." I wondered whether relative neglect stemmed from the lack of time to get played in: "Well, you have to be as relaxed as possible when performing, and only then will you produce your very best." Young Japanese violinist Hideko Udagawa has secured the patronage of the Spencer family in a big way - on Saturday she will give a recital at Althorp for the Earl and Countess and their guests, and on January 8, the Princess of Wales will hear her play the Mendelssohn Concerto at London's Barbican Hall. "The Spencers are very fond of Japan," says Tokyo-born Hideko. "I met Lady Spencer at a party given by the Japanese ambassador." She and the brilliant pianist Ian Brown will treat the gathering at Althorp to a pre-dinner hour of music, including sonatas by Mozart and Brahms and some of the short transcriptions of popular pieces by Jascha Heifetz which Hideko has recently recorded. G. K. Chesterton put it succinctly: Music with dinner is an insult both to the cook and the violinist. Hideko Udagawa, a Japanese violinist living in Paddington reveres both crafts and plays the Beethoven concerto at the Barbican later this month, cooking as a relaxation from those notorious octaves. Her sensible mother in Tokyo insisted that she went to university and learned to cook properly before she went to study with Milstein in New York. When a young musician is hailed by the most prominent members of the music world as 'gifted' and 'magnificent' that person is surely worth listening to. Such is the case with the enormously talented solo violinist, Hideko Udagawa. "I was given the violin when I was six" she told me recently, "and I started to have lessons right away. Neither of my parents were professional musicians, and they certainly had no aspirations towards me becoming one. But my mother wanted me to learn something that was a little out of the ordinary, that not everyone could do, to give me confidence. "I always liked playing the violin, and never had to be forced to practise like most children. That's how I began, but I never dreamed that I would be doing such a thing now! "Gradually I began to feel that I wanted to play the violin as a career, and when I was 15 I gave my first public performance. It was in a large hall in one of Japan's big cities, and was a wonderful experience for me. "There are many things which drew me to the violin. Firstly, there is a physical reason in that you don't have to be a very big person to play it, while it is still possible to produce a powerful sound, whereas an instrument like a cello would be much harder for me to play. Also, the violin is a very expressive instrument and I find the way that i can say so much fascinating." Hideko Udagawa came to London for advanced study with Nathan Milstein and continued her studies with him in New York at the Juilliard School of Music. "Nathan Milstein was very strict, he has a very strong personality and it was important to know exactly what I wanted to learn from him, otherwise I would have found everything far too confusing. "I studied with him for a very long time and learnt a great deal. He has an aristocratic taste which only a great musician can have. Technique and tone come through practice, but taste is quite another thing, and how to interpret the music was something which Mr Milstein regarded highly." Being remembered is important for most artists, and Ms Udagawa is no exception to the rule. "A person who paints a picture knows that the painting should last for a very long time, but performing is something quite different. Once a performance is over, it is gone forever, of course, truly great performancees will not be forgotten, but a record is special to a musician as it lasts forever. My first record is due for release in January, and I hope to record many more in the future. "Other than producing more recordings of my work, there are several other things that I would like to do in the future. I always enjoy giving concerts and want to perform new pieces that I have never played in public. I have learnt over 40 concertos and have played only two-thirds of these in public. The trouble being that the other third of my repertoire is not very popular and does not attract much interest at the box office. But I think that if I was given the opportunity to play those pieces, I could prove otherwise. "I am also interested in composing some chamber music when I get older. Of course, the hardest things that there to do I want to do while I am still young, such as playing a concerto with an orchestra or learning concerto repertoire. But when I am older, I can enjoy my work more, composing and plyaing much less complicated pieces. "It's very hard work, having to live up to other people's expectations. It is always a very big responsibility to stand in front of thousands of people and to do your best. But I try to get better every time. I perform, which is not an easy thing to do!" When she moved from Japan to London in her early 20s, Hideko Udagawa had to make her own breaks. "I wanted to study with some of the great masters; but I didn't know anyone who could introduce me," she said by phone from her New York home. After a violin concert by Nathan Milstein, Udagawa, who performs tomorrow with the Mozarteum Orchestra of Salzburg, went backstage. With "very little English", she managed to ask Milstein if he would listen to her play one time. To her astonishment, he agreed. "He showed quite a bit of interest and said he could let me come and study with him any time he was in London," she recalled. "That was the start." Over the next several years, Milstein worked with her for three to four hours at a crack, sometimes twice a week. The emphasis was more on interpretation than technique. "He has a reputation for having aristocratic taste," Udagawa said. "Anybody, by studying hard and being guided by good teachers, can get technique. But something like taste or interpretation you can't get overnight or just by practicing it. That's what he taught me - the importance of taste and tone." Unlike many rising stars who seem to have taken up the violin almost from the moment they drew their first breath, Udagawa started at the ripe old age of 6. Born to a professor of electronics and a mother who played the piano more for fun than anything serious, she loved the instrument and instinctively progressed. By her early 20s, Udagawa left for London to start her career. "I still spend about one third of my time in Europe," she said. "I still keep my apartment in London and when I have concerts in Europe, I use my base there." She wants to perform more in the United States, and to be more involved in education. "I was born in Japan and brought up in Europe and now live in America," she said. "I think I know those three continents quite well. If I would do anything to help in the understanding of those three continents through music, like a cultural ambassadro, I'm very happy to do whatever I can." Udagawa's musical partners are no strangers to Tucson audiences. The Mozarteum Orchestra of Salzburg did a residency several years back with the now defunct Festival in the Sun. Founded in 1841 by a group of teachers and students for the Salzburg Festival, the group has grown to be one of the world's foremost interpreters of the city's favorite son, Wolfgang Amadeus Mozart. It was with the Mozarteum Orchestra that the late conductor Herbert von Karajan launched his orchestral and operatic career. The group's all-Mozart Tucson program includes the Symphony No 29, K. 201; Violin concerto No 4, K. 218 (with Udagawa) and the Symphony No. 40, K.550. For Hideko Udagawa, being the great, great grand-daughter of one of Japan's most respected Prime Ministers, Lord Ii, Known for his efforts to initiate US-Japanese relations, was simply not enough. So she set out to claim note in her own right and if you want proof that she has done just that, come see and listen as this virtuoso performs at the Tilles Center on Saturday, November 4. In a telephone interview from her New York apartment, Udagawa spoke about her first US tour, which will take her across the United States from New York to California. Udagawa explains that while she started the violin at just 6 years old, it was never the intent for her to become a virtuoso. Rather, her mother started her on the violin in the hopes of bringing her out of her shell. "I was very shy and my mother thought that playing an instrument would give me more confidence. And the violin was chosen because it wasn't as popular as the piano." Her mother's encouragement paid of immeasurably. In her early 20s, Udagawa had enough courage to travel to London with hopes that the great violinist Nathan Milstein would take her on as a student. Udagawa said she played many concerts and met many people but no one could introduce her to Milstein. So, the once shy Udagawa took destiny into her own hands. She went to a performance of Milstein's and after the concert went backstage and simply asked him - and she says she spoke very little English - outright. To her amazement, he gave her his private number and asked her to call him the next time he was in town. He agreed to give her lessons and the rest was history. She was his protégé for 10 years. Now, his method of playing, an emphasis on the romantic, is apparent in her style as well. Today, Udawaga is a star in her own right, with three highly praised CDsd and standout performances throughout the world, including one in front of a sold-out audience of 3,000 in Geneva. As she approaches her first US tour, Udagawa is busy practicing and getting used to the Manhattan style of life - which she describes as full of energy and very friendly. More than the twain meets in violinist Hideko Udagawa. Born into a historic family in Japan, schooled and seasoned in Europe and now living in the United States, Udagawa sees herself as a cultural ambassador. "Not many people know three parts of the world that well," Udagawa says. "If I could do anything to help the relationship of these continents, I'd be very happy." Her vehicle is music, which she calls a universal language. Udagawa gets ample opportunity to speak that language. Fresh from engagements in Geneva and Vienna, she is teamed with the prominent Mozarteum Orchestra of Salzburg for a series of North American concerts stretching from coast to coast. The tour consists of 12 concerts in 18 days. That's rugged by classical music standards, partly because the Mozarteum travels with 45 players. The stop Friday in Green Bay kicks off the Brown County Civic Music Association 1995-1996 season. Officials of the organization are especially pleased to book the hard-to-get Mozarteum and the globe-trotting Udagawa. What Udagawa does would please her great-great-grandfather. He was Lord Ii Naosuke, who was akin to prime minister when he wrested Japan from isolation by opening it to the West in 1858. He was assassinated in 1860 in the wake of turmoil over the move. "Many people are grateful to him for what he did, and I would agree with that," Udagawa says. "He was a great man." In a sense, Udagawa has stepped through the door her ancestor opened. However, Ii might be surprised someone from his family would do the kind of thing she does, Udagawa says. "He'd think I should be doing more," she laughs. "All my family was liberated and very understanding in that sense. It was a very good thing for me. It helped me to come to the West. Nobody stopped me. And when I never went back to Japan to live (though she returns to perform), nobody complained. I'm grateful for their attitude." She suggested the work she is playing almost nightly with the Mozarteum on tour. Violin Concerto No. 4 which was composed when Mozart was young. "It's pure and simple, but you need a lot of discipline to play Mozart pieces very well," Udagawa says. For the rest of the program - all Mozart, naturally - the orchestra will play Symphony No 29 and Symphony No. 36 ("The Linz"). Founded in 1841, the Mozarteum is one of the oldest orchestras in Austria. The orchestra's extensive recordings include a complete set of Mozart's symphonies. Udagawa's experience serves her well. European orchestras have slightly different approaches than American orchestras. "I have an understanding of European music - I should, having played with many fine European orchestras - and I get on very well with them," she says. When Japanese leader Ii Naosuke capitulated to Western commercial interests in the 1850s, his career and his life came to a premature end. Ii's great-great-granddaughter, violinist Hideko Udagawa, lives not only in a different century but seemingly in a different world. Her capitulation to Western artistic interests has gotten her career off to an auspicious start. Udagawa will perform W.A. Mozart's Violin Concerto No. 4 in Tucson next week with the Mozarteum Orchestra of Salzburg. Japanese interest in things Western has come a long way since Ii, under American pressure, signed commercial treaties with the West in 1858 without imperial sanction. His firm suppression of dissent revolving around the treaties and certain domestic disputes led to his assassination in 1860. Today, the Japanese are among the most avid collectors of Western classical recordings, produce most of the equipment on which those recordings are played, enjoy the services of several symphony orchestras in Tokyo alone, and send their own young players and pianists out to impress the world with their virtuosity in European music. Technical skill was not all that interested the young Udagawa, even though, she wound up studying at Juilliard, the American hive of virtuoso drones. Having studied the violin since age 6, she resolved in her early 20s to move to London in hopes of persuading the great violinist Nathan Milstein to become her teacher. Milstein, though capable of dazzling technique, was celebrated for the nobility and intelligence of his interpretations. "When I first cam to London," Udagawa recalls, "I found out that Milstein very rarely taught and he did not take any students at that time. I did not know anybody who could introduce me to him, so after one of his concerts I just went back to see him and asked him to hear me play. "Milstein didn't listen to her there in his dressing room, but he agreed to audition Udagawa not long after that. That audition turned into a series of lessons, sometimes two a week, four hours at a stretch, every time Milstein was in London. "He always said that practicing hard would help you develop technique, but it wouldn't give you taste," she says. "He had very aristocratic taste, and I learned that from him, or some people say they hear it in my playing. And I am most fond of the German Romantic repertoire, which is a very strong influence from him. "I love Mozart, as well," she adds quickly. "But of course that requires a very different style from the Brahms concerto. Mozart is so pure and so simple, which is not an easy thing. It's a challenge to play with beautiful, pure sound." She says that sound is produced naturally by the Mozarteum Orchestra of Salzburg, the Austrian town where Mozart was born. Yet it's a big sound, made by a full symphonic ensemble, not a chamber orchestra. "I don't have to drop my dynamic range so much when I play Mozart concertos with this orchestra," she says. She says she hopes to act as a sort of cultural ambassador, smoothing relations among Japan, the United States and Europe. Repeating the old saying that music is an international language, Udagawa adds that she's talking about the European classics, not traditional Japanese music. "For me, European music appeals so much more, because it has so much more emotion. In Japanese traditional music, I don't feel it easy to express myself. I understand European music so much better."